INFORMS is the largest professional society in the world for analytics, operations research (O.R. ), and the management sciences. INFORMS is pleased to offer all readers of PA Times 25% off the INFORMS regular membership rate. Click here to learn about great member benefits and CLICK HERE TO JOIN. Mention promocode PAWATTENDEE to claim your 25% discount on membership. INFORMS also now offers analytics certification. Be among the first to earn the prestigious CAP™ designation. 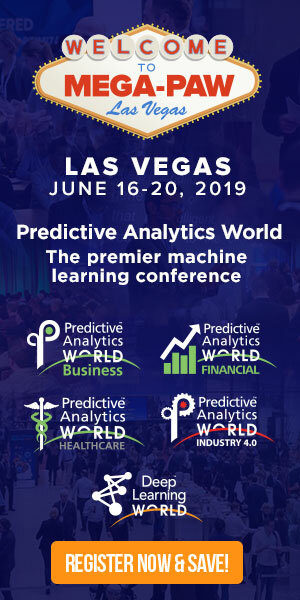 Exams are coming to Chicago on June 23; McLean, Virginia, on July 13; Seattle, Washington, on August 3; and at our very own Predictive Analytics World – Boston on October 3. Do you have what it takes to become a CAP™? Thirty–eight professionals have separated themselves by earning it already. Go to www.informs.org/certification to learn more. Predictive Analytics World is a supporter of INFORMS Certified Analytics Professional (CAP™) program.